The Gluten-Free Baking Mix Cookbook is ideal for anyone who is new to the gluten-free diet, but it’s also great for anyone who wants the ease of using a baking mix. Follow Lynn’s instructions to create your own baking mix, then use it in a variety of recipes for quick and easy breakfast, bread, dessert, and dinner foods. I was so excited to try the chicken and dumplings. Honestly, that is one thing I have missed, and not been happy with any I tried gluten free, since going gluten free last year. That one recipe alone makes this book worth purchasing. But it gets even better! I have tried five recipes so far, all were a hit even with the non-gluten free members of the house. I made two batches of the basic bake mix, one with lard and one with butter. I used the lard version on the chicken and dumplings, the old fashioned apple cake, and the pizza biscuit bites. The butter version would maybe have been a better choice for the cake, but it was all fantastic. Blueberry oven pancakes for breakfast were gobbled down, and the blueberry cobbler was requested again. I can not recommend this book enough and I look forward to trying more of her recipes and creating my own with this basic baking mix! 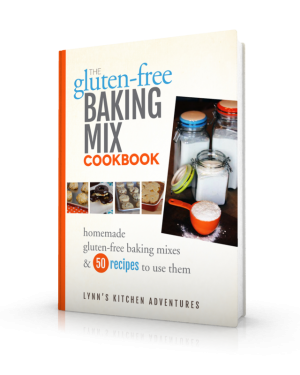 We are a Celiac family and have loved some of Lynn’s recipes from her blog – so I was really excited to test out some of the recipes in this e-book. The entire book is based off a simple mix – one using ingredients most gluten free kitchens will have on hand, which is much appreciated. She does warn that you may have to make the mix in two batches – I thought since I was using a 12 cup Kitchenaid food processor I could do it in one — but I was wrong. So two batches it was. It was simple though, and it actually smelled like Bisquick! The first thing I made from the book was her “Quick and Easy Chocolate Chip Cookies.” They were very quick to mix up, and very delicious. They are even still soft the next day, but not break-y. Thumbs up from all my in-home taste-testers. The other recipe I have tried so far was the “Easy Gluten Free Pizza Crust.” WOW. When she said easy, she was not kidding. It took minutes, and turned out so well. It was very filling, unlike some of the store-bought gluten free pizza shells, and it was very sturdy – you could pick each piece up and it wouldn’t bend or fall apart. My husband even commented that it is better than several gluten-free pizza offerings we have had in restaurants, and my kids and I agree. I will attest that the leftovers were good too!